LONDON - Wilkinson is to increase its media spend as it embarks on an expansion drive that will continue throughout 2009. The hardware and home goods retailer is aiming to fill the gap left by the closure of Woolworths, by tapping in-to the discount market. It is understood that an ad campaign will target consumers who used to shop at Woolworths, which stocked a similar range of goods. Wilkinson is also set to appoint its first retained media planning and buying agency. Previously, the brand worked with agencies only on a project basis. The retailer's plans to extend its branch network will begin with store openings in East Ham in London, Leeds, North Yorkshire, Newton Aycliffe and Ferndown in Dorset. Wilkinson will use its marketing strategy this year to build on the brand overhaul it underwent last October. 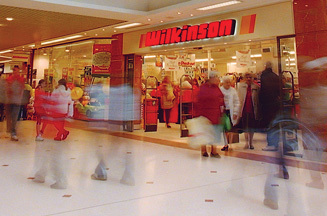 The activity included the roll-out of a fresh logo, which brought together the Wilkinson and Wilko names. It also introduced the strapline 'The home of family value' to flag up its heritage as a family-run company. Wilkinson's most recent campaign, created by mobile outdoor company Look Media, ran across outdoor poster sites and included activity outside its stores.